Diamonds, diamond facts, diamond products, how to buy diamonds etc. 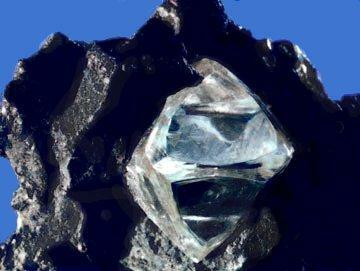 When you see a diamond in its natural condition it is not very attractive. It is, in fact, very ugly. There is no shine or sparkle to a natural diamond. It could be mistaken for a piece of glass if you did not know what to look for. To create the beautiful diamond that everyone recognizes the stone must be cut and polished. Saws are used to cut diamonds into a round shape. It is from this point that the other shapes of diamonds will be cut. The quality of the cut is more important than the shape of the cut. When a diamond is not cut properly it will lose its ability to catch the light. You will not get any sparkle from a diamond that has been improperly cut. The facets of the diamond must be painstakingly cut with perfect precision to achieve the sparkle that is desired. Once the facets are cut the diamond can be cut into the shape that is desired. Once the diamond is cut it is put into a cup that is called a dop. In the cup is another diamond because a diamond can only be smoothed by another diamond. When the diamond has been cut shaped and been smoothed by the dop it will be polished on a polishing wheel. There is a wide variety of diamond cuts. The shape of the diamond is what is referred to by cut. The shape of the diamond can be very important in the way the diamond catches and reflects light allowing it to sparkle. Popular cuts of diamonds are marquise, heart, pear, oval, princess, trillion, and round. 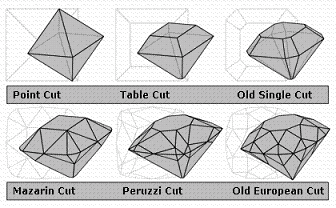 Diamond cuts have evolved slowly from the days of the Point Cut to the Old European Cut. The figure shows the stages of evolution. Not only does the cut of the diamond affect the sparkle, but also how well the diamond is cut will affect the sparkle. When a diamond is cut badly it will lose the ability to catch light and not sparkly properly. If you are in the diamond business then you know that the word cut does not actually refer to the shape of the stone, but the depth, brilliance, clarity, width and durability. There are many variables to determine the cut of the stone. There can be many problems associated with cutting the diamond that will make the diamond less desirable. If the tool is damaged or there is a misalignment of the cut the diamond will be affected. When you are shopping for a diamond you should select the shape that you want. But you should also take a look at a few shapes of diamonds to find one that has the best cut. This will be the diamond that has the best sparkle in any light. Copyright © 2008 Diamond Facts.